Invasion of Astro-Monster (怪獣大戦争, Kaijū Daisensō, lit. The Giant Monster War) is a 1965 science fiction kaiju film featuring Godzilla, directed by Ishirō Honda, with special effects by Eiji Tsuburaya. The film stars Akira Takarada, Nick Adams, Kumi Mizuno, Akira Kubo, and Yoshio Tsuchiya, with Haruo Nakajima as Godzilla, Masaki Shinohara as Rodan, and Shoichi Hirose as King Ghidorah. It is the sixth film in the Godzilla franchise and Shōwa series. The film was a Japanese-American co-production; it was the second collaboration between Toho and UPA. Invasion of Astro-Monster was released in Japan on December 19, 1965 and was given a theatrical release in the United States on July 29, 1970, on a double bill with The War of the Gargantuas. Glenn and Fuji begin to worry that the Xiliens may have ulterior motives. Their suspicions appear confirmed when three Xilien spacecraft appear in Japan. The Controller apologizes for coming to Earth without permission. The Xiliens locate Godzilla and Rodan, both sleeping, and use their technology to transport them to Planet X. They also bring Glenn, Fuji, and the scientist Sakurai with them. After a brief confrontation, the Earth monsters succeed in driving Ghidorah away. Glenn and Fuji sneak away during the battle and encounter two Xilien women, both of whom look identical to Namikawa. Xilien guards confront the astronauts and bring them back to the Controller, who reprimands but does not punish them. The astronauts are given a tape with instructions for the miracle cure and sent home, leaving Godzilla and Rodan behind. The tape is played for the world's leaders, but instead it contains an ultimatum demanding that they surrender Earth to the Xiliens or be destroyed by Godzilla, Rodan and Ghidorah, who are under the aliens' control. Invasion of Astro-Monster was the sixth Godzilla feature film. In the mid-1960s, United Productions of America (UPA) asked American producer Henry G. Saperstein to acquire high quality monster movies to distribute in North America. Saperstein approached Toho and began involvement in the film when Frankenstein Conquers the World was already in its production phases. The production of Invasion of Astro-Monster saw the film have input from American producer Henry G. Saperstein from the beginning of production and was his first fully-fledged coproduction. Saperstein has claimed to have provided 50 percent of the funding to the three monster movie co-productions he made with Toho. Saperstein felt that the screenplays by Shinichi Sekizawa were formulaic, noting that these films too often "opened up with a press conference or a government conference of scientists and officials" and that he convinced the production that they "needed to get into the picture a lot quicker. The conference could take place later on". The film's script also incorporates an alien invasion theme that had been done in previous Toho films, but not in the Godzilla series. 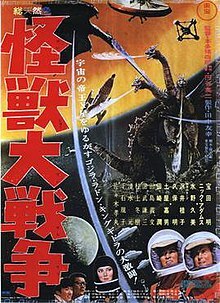 Invasion of Astro-Monster was released in Japan on December 19, 1965 by Toho. The film brought in about 3.8 million viewers in Japan and grossed ¥210 million during its theatrical run. Nick Adams' voice was dubbed over for the Japanese release. It was re-issued in Japan in 1971 where it was edited to a 74-minute running time under the title Kaiju daisenso Kingughidorah tai Gojira (lit. The Giant Monster War: King Ghidorah vs. Godzilla). Co-producer Henry G. Saperstein commissioned an English dub from Glen Glenn Sound, a Los Angeles-based company, for the film's American release. Unlike some previous Godzilla films which were heavily edited for their American release, the American and Japanese versions of the film were described as by David Kalat as "virtually identical". Among the changes in the American version of the film include improvised "Planet X language" scenes spoken by Yoshio Tsuchiya being cut, and a few brief shots involving the flying saucers at Lake Myojin. Audio was changed as well with sound effects added for Godzilla and several pieces of Akira Ifukube's score re-arranged. The American version had a running time of 92 minutes. The Glen Glenn Sound English dub was released theatrically in the United States on a double bill with The War of the Gargantuas (also dubbed by Glen Glenn Sound) on July 29, 1970 as Monster Zero by Maron Films. Regarding the time it took for the film to be released in the United States, Saperstein stated that Toho did not always want to release a film quickly for international release and that he had a lot of technical work to be done on the film. Variety reported that Saperstein had completed post-production in 1966 and was negotiating a distribution deal. Variety reported again in September 1970 that both the film and The War of the Gargantuas "sat on the shelf at [UPA] because [distributors] figured they had no potential". In 1986, the American version of the film was released in the United States on VHS as Godzilla vs. Monster Zero, to coincide with the VHS release of Godzilla 1985. The title Godzilla vs. Monster Zero was also used when the film was broadcast on American TV stations. In 2007, Classic Media released the film on DVD in North America, along with other Godzilla titles. This release included the remastered, widescreen versions of the Japanese and American versions, as well as image galleries, poster slideshows, original trailers, a biography on Tomoyuki Tanaka, and an audio commentary by historian Stuart Galbraith IV. In 2014, Toho released the film on Blu-ray to commemorate the 60th anniversary of the franchise. In 2017, Janus Films and The Criterion Collection acquired the film, as well as other Godzilla titles, to stream on Starz and FilmStruck. ^ During filming, Nick Adams delivered all of his lines in English, however, he was dubbed over by Gorō Naya for the film's Japanese release. Adams' original English dialogue was restored for the film's American release. ^ a b c Galbraith IV 1996, p. 292. ^ a b c d e f Galbraith IV 1996, p. 293. ^ a b c d Ryfle 1998, p. 121. ^ a b c d Galbraith IV 2008, p. 225. ^ Ryfle & Godziszewski 2017, p. 223. ^ a b c Ryfle & Godziszewski 2017, p. 229. ^ Ryfle & Godziszewski 2017, p. 227. ^ a b c d Ryfle 1998, p. 355. ^ a b c d e Kalat 1997, p. 81. ^ Ryfle 1998, p. 122. ^ Kalat 1997, p. 84. ^ a b Kalat 1997, p. 82. ^ a b Kalat 1997, p. 83. ^ Kalat 1997, p. 85. ^ a b c d e Ryfle 1998, p. 125. ^ Kalat 1997, p. 100. ^ a b Ryfle 1998, p. 151. ^ Kalat 2010, p. 82. ^ Kalat 2010, p. 167. ^ Galbraith IV 2007, 0:13. ^ Kotz, Sean (June 4, 2007). "DVD Reviews: Ghidorah, the Three-Headed Monster and Invasion of Astro-Monster". SciFi Japan. Retrieved May 4, 2018. ^ Squires, John (November 8, 2017). "Criterion Collection Has Obtained Most of the Shōwa Era 'Godzilla' Films!". Bloody Disgusting. Retrieved November 8, 2017. Galbraith IV, Stuart (2007). Invasion of Astro-Monster Audio Commentary (DVD). Classic Media. Kalat, David (1997). A Critical History and Filmography of Toho's Godzilla Series. McFarland. ISBN 0-7864-0300-4. "怪獣大戦争 (Kaijū Daisenso)" (in Japanese). Japanese Movie Database. Retrieved 2007-07-17.